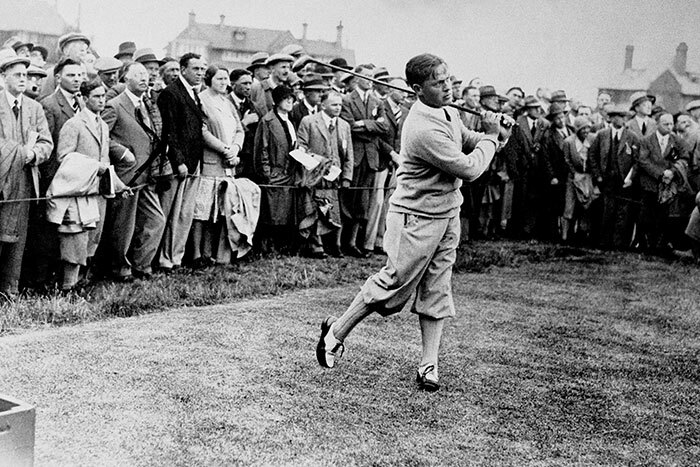 Bobby Jones at the Open Championship, Royal Liverpool Golf Club, Hoylake, 1930. Credit: Reproduced by permission from Press Association Images. These matchbook-sized flicker books from 1930 animated Jones’ famous swing. Credit: General collection, Manuscript, Archives, and Rare Book Library at Emory University. Photo by Paige Knight, Emory Libraries. 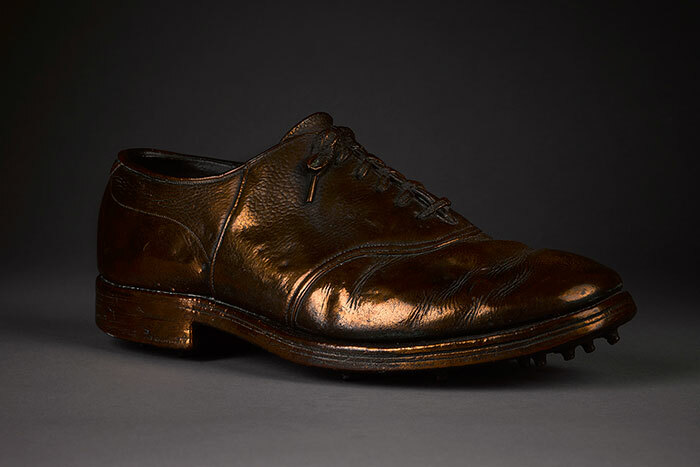 This is one of the shoes Jones was wearing when he won the 1930 U.S. Amateur Championship at the Merion Cricket Club. Jones’ victory in this championship clinched the Grand Slam. Credit: Photo by Paige Knight; from the Bobby Jones collection, Manuscript, Archives, and Rare Book Library at Emory University. 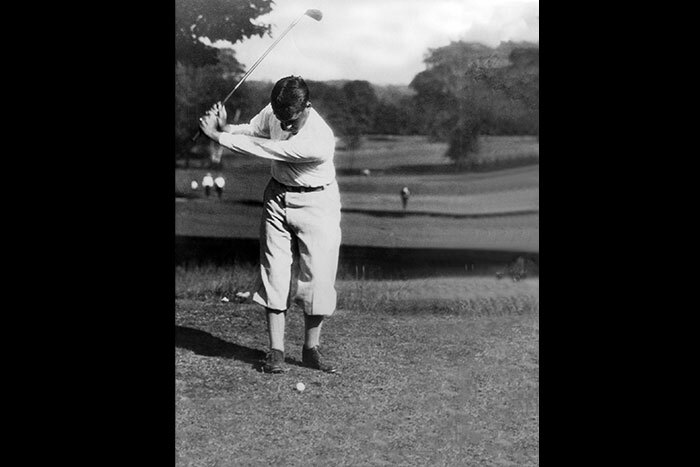 Bobby Jones, circa 1922. Credit: Sidney L. Matthew Bobby Jones collection and research files, Manuscript, Archives, and Rare Book Library at Emory University. Download, 1.6 MB, Credit: Sidney L. Matthew Bobby Jones collection and research files, Manuscript, Archives, and Rare Book Library at Emory University. 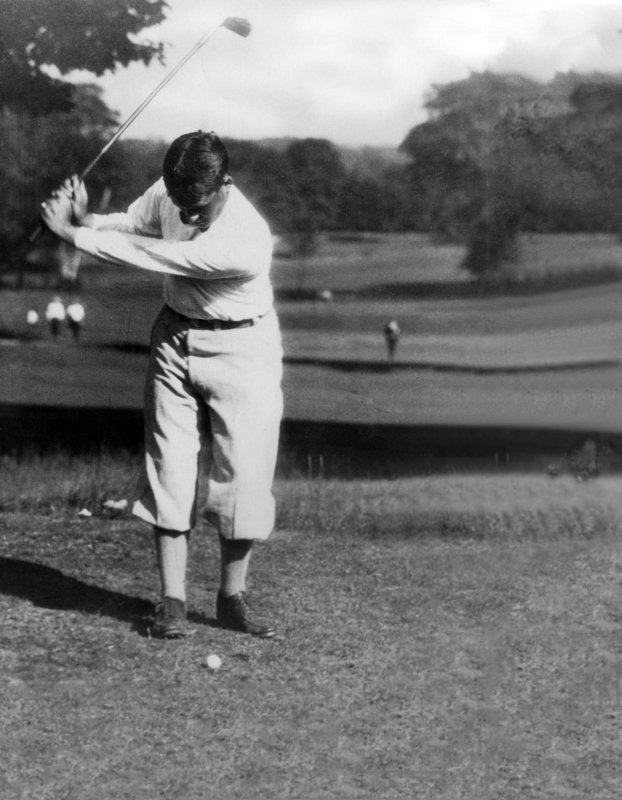 Emory University's Manuscript, Archives, and Rare Book Library (MARBL) will stage its first major exhibition of materials drawn from its collections related to legendary golfer Bobby Jones. "Bobby Jones: The Game of Life" opens Thursday, Feb. 12, in the Schatten Gallery on Level 3 of the Robert W. Woodruff Library. The exhibition, which will remain on view through Nov. 30, 2015, is open to the public at no charge. "The life of Bobby Jones exemplifies so much of what we value at Emory: scholarship, self-discipline and social conscience," says MARBL director Rosemary Magee. "This exhibition invites us to immerse ourselves in his remarkable legacy." The exhibition’s title is a reference to one of Jones’ many notable quotes: "Golf is the closest game to the game we call life. You get bad breaks from good shots; you get good breaks from bad shots – but you have to play the ball where it lies." Robert Tyre Jones Jr. (1902-1971) remains known as the most successful amateur golfer in the history of the sport, in particular for taking the Grand Slam title in 1930 after winning the four major championships of his time in a single calendar year. "No one had done that before, and no one has done it since then," says Randy Gue, MARBL’s curator of modern political and historical collections, who is co-curating the exhibition with project archivist Kristin Morgan. The materials on display are drawn largely from two MARBL archives: the Bobby Jones collection, acquired in 1967, and the collection of research and original material from Jones biographer Sidney L. Matthew, acquired in 2012. The display was designed by the Emory Libraries’ exhibitions team, led by Kathy Dixson. "This exhibition chronicles the growth of Bobby Jones, both as a golfer and a person," Gue says. "We start with Jones as a young, natural talent who struggled with his own temper and the pressure of competing against much older, more experienced players; we examine his new mental approach that allowed him to move past those obstacles and eventually win the Grand Slam; and follow his accomplishments in retirement and his battle with a debilitating disease." Gue and Morgan hope visitors will learn more not only about these aspects of Jones’ life, but also about his connection to Emory. Jones entered Emory University School of Law in 1926 and passed the bar exam after just a few semesters. Emory established the Robert T. Jones Program, which administers scholarships and fellowships that send students to study in St Andrews, Scotland. The Jones Biomedical Engineering Fellowship, in collaboration with Georgia Tech, offers a joint doctorate, awarded by both schools, that integrates life sciences and engineering. The Laney Graduate School Jones Program in Ethics provides a foundation in ethics to students in humanities, social sciences, biomedical and natural sciences, public health, nursing and business. 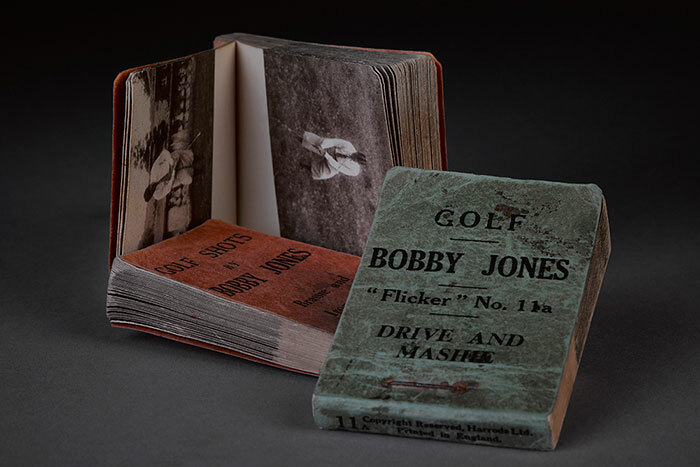 And the two Bobby Jones collections in MARBL give students, faculty and the public access to a wealth of material about a person who became known as a gentleman golfer. The exhibition will include photographs, newspaper articles, magazine covers and interviews, film footage and artifacts. The Schatten Gallery corridor will feature multiple photos that break down Jones’ swing. Morgan says seeing the tournament photographs and reading the newspaper headlines and articles really brings the Jones story to life. "There are plenty of books, stories and movies about Bobby Jones, but being able to actually see the expression on his face when he won, seeing the headlines at the time, and reading how writers referred to him as ‘Little Bob,’ is a lot of fun," Morgan says. "A Boy Defeating Men" explores the development of his talent, apparent from a young age. He first picked up a club at age 5, won his first junior tournament at 9, won two club tournaments playing against adults at 13, and played in his first national tournament at 14. But the mounting pressure to win and his infamous temper kept him from capturing a major tournament title for seven years. "Championship Golf" chronicles how Jones learned to control his temper and change his mental approach by focusing on beating "Old Man Par" (besting the par for the course) rather than his opponents, which led to the start of his winning streak in 1923. This was a time when Jones was balancing his golf career with many personal commitments – his education at Georgia Tech, Harvard and Emory’s law school, as well as marriage and family. "The Grand Slam" illustrates how Jones was able to meld physical talent with his mental approach in the years leading up to his Grand Slam title, and focuses on each of the tournaments that led to his title win. Among the items on display: one of the shoes, now bronzed, that Jones was wearing when he won the U.S. Amateur Championship, the final tournament of the Grand Slam; and replicas of the clubs he used during his Grand Slam season. "Play the Ball Where It Lies" gives perspective on Jones’ life after his retirement from tournament play – spending time with his family, co-founding the Augusta National Golf Club and the Masters Tournament and co-designing the course, and battling syringomyelia, a painful and progressive disorder characterized by a fluid-filled cyst in the spine. He was diagnosed in 1948 and died of the disease in 1971. The exhibition will include interactive components, such as digitized 1930s flicker books that animated Jones’ swing when the pages were turned at a rapid speed; these will be available for visitors to explore on a mounted iPad. The media room will feature film footage of Jones’ Grand Slam tournaments in 1930, as well as interviews conducted by Sid Matthew with Jones’ friends and competitors for the documentary "The Life and Times of Bobby Jones." The Robert W. Woodruff Library is located at 540 Asbury Circle in Atlanta, 30322. Parking is available in the Fishburne and Oxford Road decks.